There probably isn’t any other sport that offers the accessibility to the ‘action’ than professional road cycling. Mountain biking at the highest level requires a ticket to spectate, but even at the worlds greatest races like the Tour there’s no charge to see Cavendish, Contador and Froome. There are one or two downsides to watching this free event though. Choosing the right vantage point to see the peloton go by is important, but so is the type of race. With average speeds of 40kmh plus on flat stages your taste of the action could be over in seconds. It’s not surprising that the biggest crowds gravitate towards the climbs where there’s interest from the front of the race to back with the specialist climbers trailed by those who are battling to beat the time cut off. The biggest crowds away from the grand tours tend to be in countries where there’s a strong cycling culture, but that hasn’t stopped the UCI and race organisers promoting races in less obvious locations. Hosting a stage race in Dubai isn’t so unusual with races in Qatar and Oman already well established. A race in one of the richest, albeit smallest countries in the world. would have made sense to the people behind it. That said there were mutterings when the race was announced; was there a need for another sprint orientated, desert based stage race early in the season? Getting big names like Cavendish signed on to the project early on was certainly going to help. While the race was never going to get full world tour status in its first year the field including numerous big names including world champion Rui Costa, Fabian Cancellara, Peter Sagan and Marcel Kittel. The race would be held over four stages; an opening time trial, two out-and-out sprint stages with a lumpier stage that might favour the classics riders in between. With world TT champion Tony Martin in the Omega Pharma line up the winner of the opening stage might have seemed like a foregone conclusion. Martin was due to leave the starters hut late on, but before that we had the unusual sight of riders using standard road bikes for the test. The decision was taken, apparently on cost grounds, to run normal bikes to help out the lower division teams like Dubai Skydive. It did seem strange that a race held in Dubai should be so cost conscious! As things turned out Martin could finish no better than fifth on the stage. The win was taken by BMC’s Taylor Phinney who would take the leaders blue jersey, designed by Versace no less, and hold it for the rest of the event. Martin blamed his late start, but it’s easy to understand why the organisers would have wanted the rainbow stripes going off last to try to establish more interest in the race. The opening TT ran around the skyscrapers of central Dubai and watching a test live, often less than scintillating, was further hampered by loss of pictures due to the size of the buildings all around. It was at least one way to learn that someones idea of architecture is to create a pastiche of Big Ben for their latest addition to the Dubai skyline. Like the sprint stages in Qatar the format in Dubai was often a parcours that involved heading out of the central area before returning for the finish. Stage two finishing at the man-made ‘palm’ that juts into the Arabian sea was inevitably billed as a Kittel Cavendish showdown. Cav, reunited with lead out man Mark Renshaw was making all the right noises before the race began. At the finish it was Kittel from Sagan with the British champion outside the top 20 even. Kittel won the two remaining stages also, surprising everyone at the finish of stage three by managing to keep with the leaders over the climbs. Cavendish too wasn’t left behind, but unlike the Giant riding giant he wasn’t near enough to contest the sprint. Cavendish seemed more agitated, according to Eurosport co commentator Brian Smith ahead of the final stage, but it looked like a mechanical spared any criticism of his lead out. We shouldn’t read too much into the Kittel white wash. In the immediate aftermath of the final stage Cav was all smiles as he congratulated his rival. It looks as if they’re good friends too, based on the exchanges between the two on Twitter. It was a somewhat experimental sprint train for Cavendish too with new signing from BMC, Peter Velits and Renshaw. While all eyes were on Kittel, Renshaw was well in the mix on the sprints which suggests he still has the speed to get Cavendish where he needs to be when it counts. If anyone seemed annoyed on the final stage it was Peter Sagan who crashed towards the end and threw his broken Cannondale away either in anger at himself or the unknown assailant who took him out. 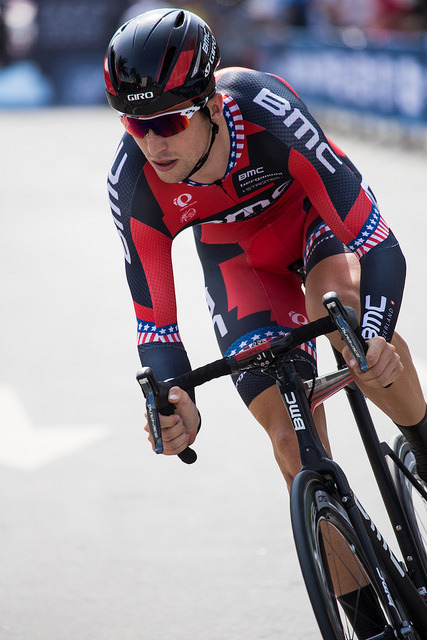 Phinney was also in the mix in each sprint and confided that he had enjoyed his best ever pre season in terms of preparation. He could be one to watch in the classics this year and BMC are another team that seem to be improving under new management after an underwhelming 2013. With the access all areas nature of stage racing comes a similar low fi level of the facilities for the riders as well as spectators. Its not unusual to see teams regular support vehicles absent in some of the fly-away races, but something that’s absent for the riders at every race is toilet facilities. Another unique aspect of watching live cycling is the sight of riders peeling away from the peloton. A sudden bout of punctures and mechanicals? Oh no, this is the inevitable toilet break and is invariably followed by a swift cut away to spare the viewers blushes as the riders relieve themselves. There are of course varying techniques that are employed. Greg Lemond famously used one of his domestiques casquettes (cap) when struck down with diarrhea at the Tour. Some of the better bike handlers like Tom Boonen are inclined to pull down their bibs and do their business on the road, sometimes putting a hand on another rider for support as they go. In the polished streets of Dubai it was something of a dilemma then with no convenient bushes to hide behind. VCSE wonders just who’s wall it was that got used on that final stage in Dubai.